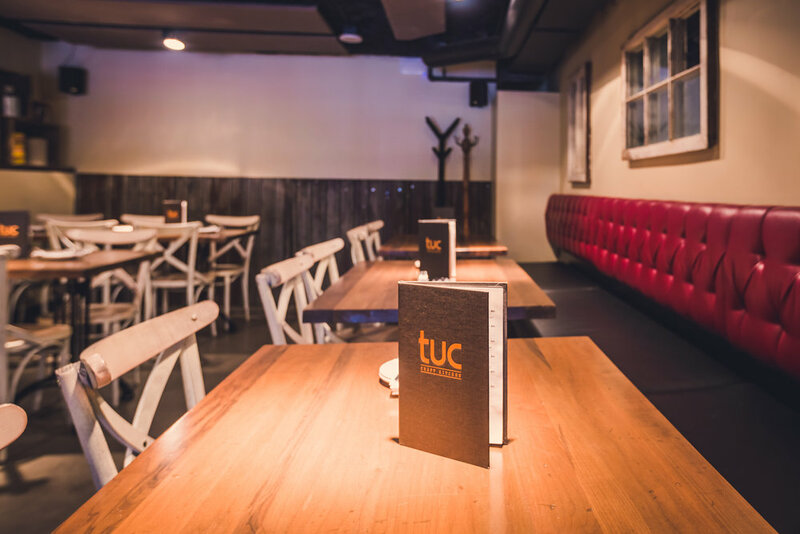 Whether it’s for a relaxed and intimate dinner for a small group, cocktail reception or a large corporate affair, Tuc can help plan and host an unforgettable event with three unique set dinner menus and canapé menus for cocktail-style events. For brunches, we kindly request that clients place their order one day in advance so our staff can prepare and deliver the perfect event for your guests. We look forward to hosting your next celebration in one of our beautiful private dining spaces. We are happy to welcome large groups for brunch from Friday to Sunday starting at 1 p.m. or for dinner events from Sunday to Thursday at 6:30 p.m. or earlier and 8 p.m. or later and from Friday to Sunday at 6 p.m. or earlier/8:30 p.m. or later. Most celebrations or corporate dinners are hosted in our semi-private mezzanine that overlooks the dining room and seats up to 38 guests at two long communal tables. For groups of 50 or more we offer full restaurant buyouts and can accommodate up to 70 guests for a seated event on the main floor and mezzanine or 100 guests for a partially seated, cocktail-style event. To book the mezzanine or full restaurant, a minimum spend for food and beverage will apply. Room charges may also be applicable. Please complete the form below, including specific details of your event and submit your request. We will send you an email confirmation within one business day and then get to work helping you plan a memorable event. If you have questions you may also contact us at info@tuccraftkitchen.com. Is it a private function? Thank you for your booking request. We will be in touch with you shortly to confirm your group booking.